This Friday, Norways capital Oslo with its 600 000 got a shock event by a bomb which exploded in the middle of city centre. In a peacefull country like Norway, with its only 4.5m people, this comes like a shock. My office, from where I work felt the blast from the bomb and then just few hours after this blast, over 80 people got killed at Utøya, a small island where the labour party had its summer camp. This person, so called Anders Behring Breivik at age of 32, was a member of FRP. A party in Norway which is known for beeing nationalist and anti-foreigners party. Anders have staded that he hated our prime minister and called him for «Stoltenberg-jugend» and named Gro (our first female prime minister) a landskiller «landsmo(r)deren», the Norwegian newspaper Dagbladet says. 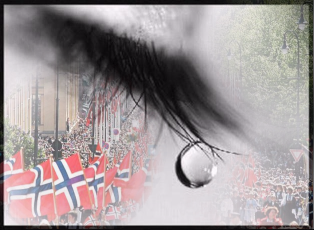 We at Distrita sends all the tears and thaughts to all who have been victims at Utøya island and because of the bomb blast in Oslo city centre. In the end I think that everyone gets out of this tragedy with brighter and better understanding of whats good or bad. Norway might be the best country to live in as UN have stated for many years, but things can happen here also. Live the life, be strong and look at this event as something to learn from. We shouldnt make everything more strict because someone wants us to change. Let us respect everyone, either they are believers or not, black or white. Respect to all that have survived! Thanks for reading our magazine. This event made me even more sure about what Distrita is doing is right.